Even the most experienced and seasoned mountain climbers have a support system, and your organization shouldn’t be any different. Planning an Office 365 support system doesn’t mean spending a lot of money. A support system can be as simple as a go-to power user on the team or as complex as a full-fledged call center. Depending on the size of your organization, your support system can take many different forms. A good strategy, however, is to take a tiered approach by starting with communal support through some of the collaborative features of Office 365, such as SharePoint and Lync. Besides, isn’t it poetic to use Office 365 to support Office 365? The community can provide base-level support and work together to figure out the technology. When the community cannot help, then you can call in the big guns by requesting support from your partner or even from Microsoft itself. By creating a vibrant community that collaborates and supports each other, your organization will have a much better Office 365 experience. The cultural changes that come about from an integrated and connected workforce can add a tremendous return on investment to the organization. With Office 365, you have the tools, but every employee must use them to make the transition effective. 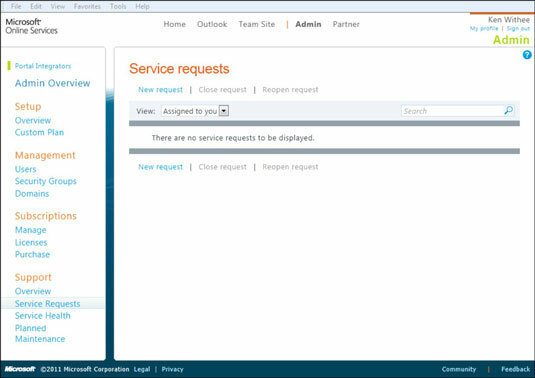 When you need to enter a service request with Microsoft, you can do so right from within the Office 365 administrator portal.